Google recently launched a buy button to help make mobile shopping easier. Although the service is still in beta testing, retailers are asking questions as to whether “Purchasing on Google” will benefit their online stores. For the time being, the service is not going to impact retailers a great deal. The most online businesses can do for mobile at the moment is to make sure you have a mobile responsive website that is easy to navigate on handheld devices. However, you should consider the Purchasing on Google service once it does becomes universal. But before you get used to the idea, you should be aware the buy button is only available to the search engine’s pay-per-click customers. How does the Google buy button work? Google’s so-called “buy button” will only appear in search engine results on smartphones and tablets. The principle idea is to make buying online easier for mobile users. The service works in a similar way to the Amazon set-up. The only real difference is that retailers are given more advertising space and visibility on Google. With Amazon, consumers don’t really know who they are buying from without clicking-through to the product page. The first time a mobile user buys merchandise using the buy button, they input their payment details which are then stored with Google rather than retailers. Consumers only have to do this once. And there is the benefit – convenience. For every subsequent purchase, consumers do not have to input payment details again. Google just sends the payment on to the relevant retailer. All you have to do is register the order and ship the goods. In theory, Purchase on Google provides a better experience for both buyers and sellers as it negates admin tasks every time anybody makes a purchase. 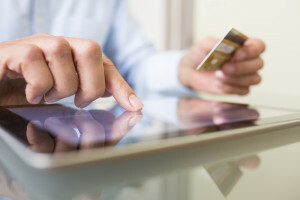 Once payment details are stored, they are passed to relevant retailers to prepare delivery. Should retailers use Purchase on Google? If you are already engaged in a pay-per-click campaign, then sign up for the Google buy button. The service is not expected to merge from beta testing until at least the fourth quarter, depending on how well the service is received by buyers and sellers. Convenience is a major plus for mobile shoppers, and the Google buy button is an ideal solution. This one simple addition is expected to increase conversions just because the payment process is quick and easy. It’s a huge time-saver. As a result, merchants with buy buttons will be given priority in search results – principally because the service is directly attached to AdWords. PPC customers have improved visibility anyway and not taking advantage of the buy button is not good business practice. Theoretically, Purchasing on Google is a win-win situation for retailers. From a customer service point of view, Google is taking the risks because any failed orders will be associated with them rather than the retailer. It is likely then that the service will only be available to Google Trusted stores. If you are not already using AdWords as part of your digital marketing strategy, it may be time to consider adding PPC to your arsenal.